Blogging 101 says always take horizontal photos. That’s not easy to do when writing about Dubai. Carved out of a Bedouin desert outpost, Dubai can’t spread out much more, so it is growing up—and down. When I first visited ten years ago, the Burj Khalifa was only twenty stories high. Now finished, it reaches to 148 stories. You may remember the last Mission Impossible, with Tom Cruise dangling out of a window one-half mile up from the ground. Everything is spectacular in Dubai. Over the years I’ve watched so many futuristic skyscrapers rise to the sky, to the point where I feel shorter and shorter with each visit, like a minnow navigating the monoliths of Halong Bay. You may think minnow is an unlikely metaphor in a story about the desert, but it’s not. 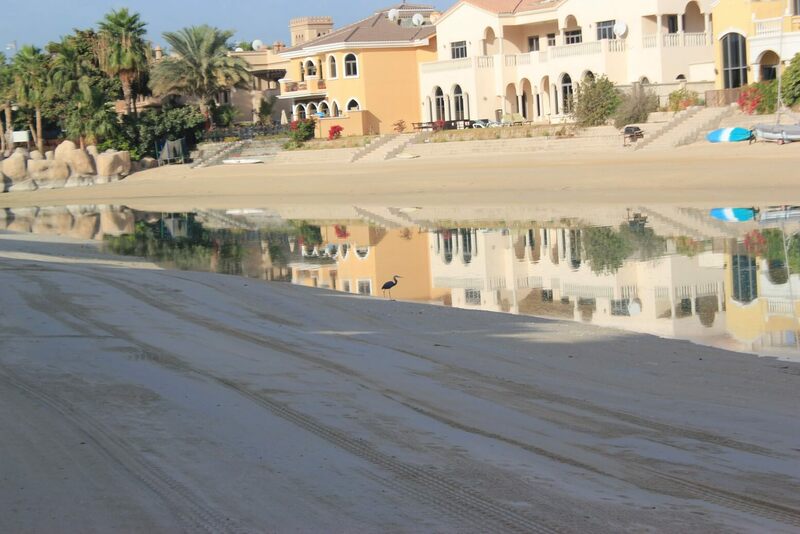 Dubai’s creative construction engineers now focus on bringing more water features into the desert. The famous dancing fountains below the Burj Khalifa and The Address (covered in tarp while undergoing repairs from the giant New Year’s Eve fire–everything is spectacular in Dubai), represent a modest water feature when compared with the plans for new developments. The fountains, dancing in this pool during the evening, rival those at the Bellagio. My favorite is the Middle Eastern theme, where the spouts of water seem to be belly dancing. Places like The Marina, an artificial canal city built in 2003, show the new direction in water features. Late one afternoon we walked an area of about three blocks square, saw shops, restaurants, hotels, and condos, and then stopped for tea at a waterfront cafe. 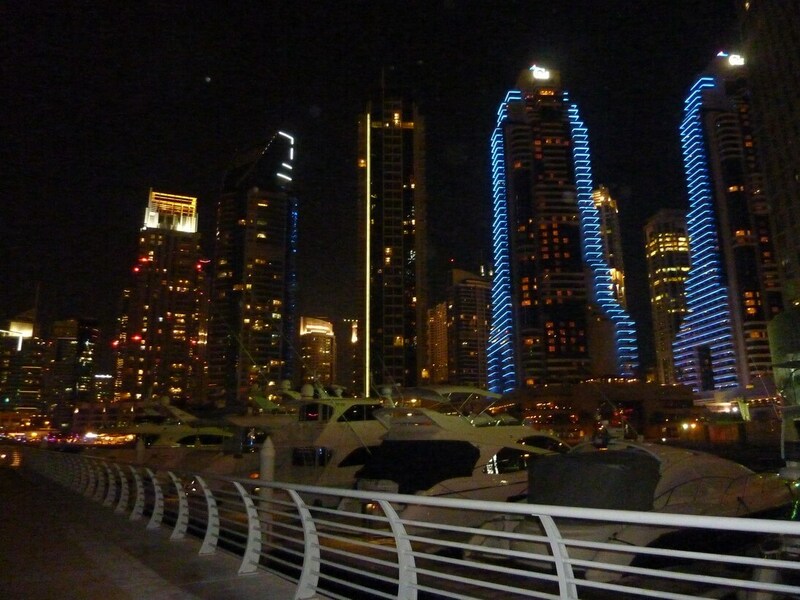 The Marina is a beautiful place for a stroll, day or night. But after one day among the skyscrapers, I’d walked enough. 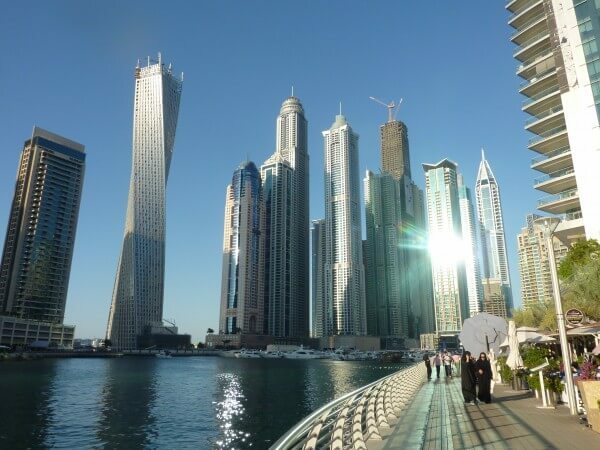 Tall buildings look close, but it’s an optical illusion that has you walking much farther than you had planned. So I took refuge with my friends in a place that has grown down. The Palm Jumeirah is a palm-tree-shaped island on reclaimed land. Homes went on sale in 2006 and sold out immediately because they’re all on the water. 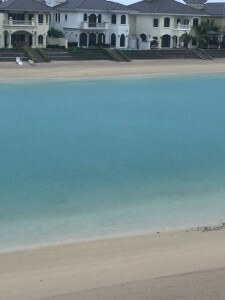 I appreciated the quiet beauty of their neighborhood, with water flowing in from the Persian Gulf separating each frond. You cannot hear the traffic out on the “stem,” running up the middle of the palm tree, and no motorized watercraft are allowed to enter the frond area. Early morning walks are so pleasant. 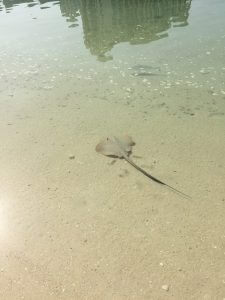 You find herons, shells, jumping fish, and sometimes rays in the middle. 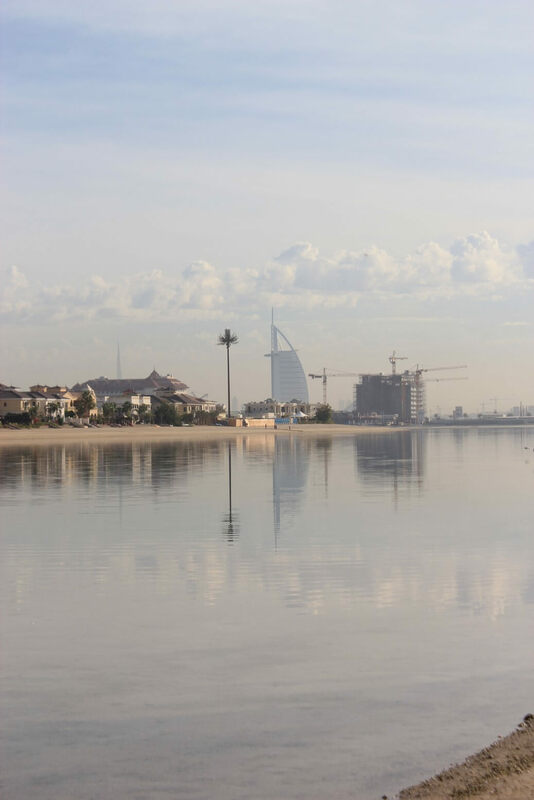 The first morning was hazy, but I could still enjoy the view of the sail-shaped Burj al-Arab and the monstrous Burj Khalifa in the distance. The tall pole in the foreground is the creative approach to a telecommunications tower. And like every other scene in Dubai, the construction crane is ever-present. 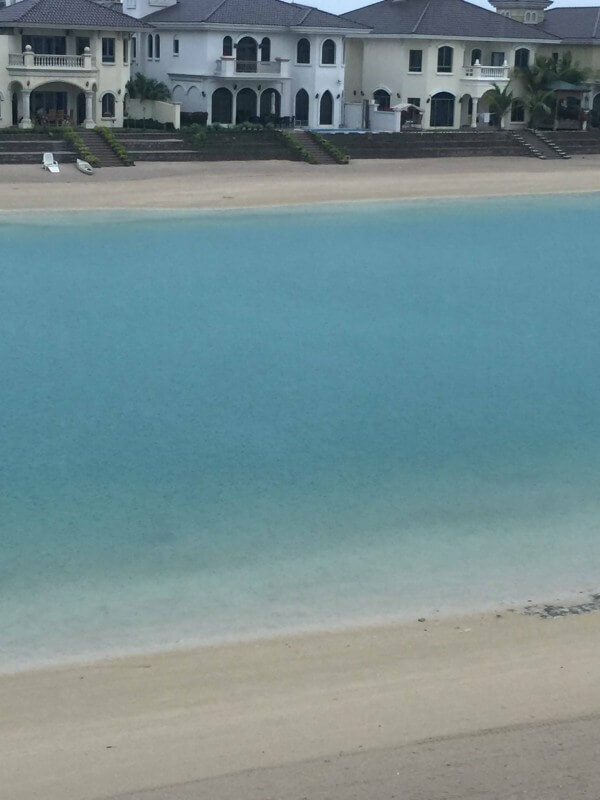 While environmentalists still scream about the reclamation projects, the government (Coastal Monitoring Program) has responded to their concerns and found some solutions to their complaints. The monitors believe that the quality of the coastline environment is returning. Environmentalists also claim the island has sunk half an inch. My friends see no evidence of that. Their house has not settled, there are no cracks anywhere, and the underground pipes and conduits work just fine. The Palm was initially conceived as a grand endeavor to draw tourists and tourist dollars when the oil supply runs dry (rumored to be this year). 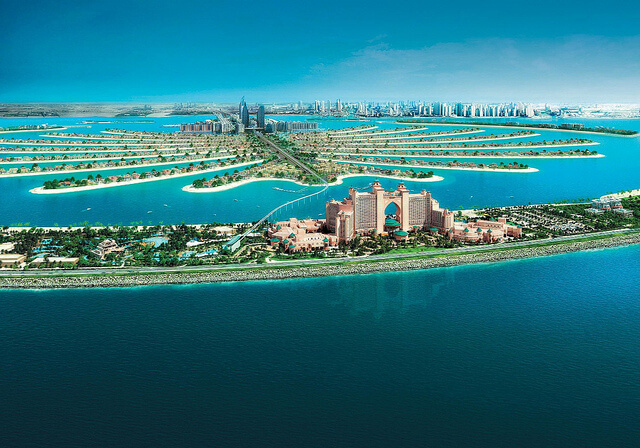 Consistent with everything else in the Emirates, the Palm Jumeirah had to be a wonder of the world. In this case, it is the world’s largest artificial island. At first, The Palm was to be a circle, but then, who would want to live in the middle? 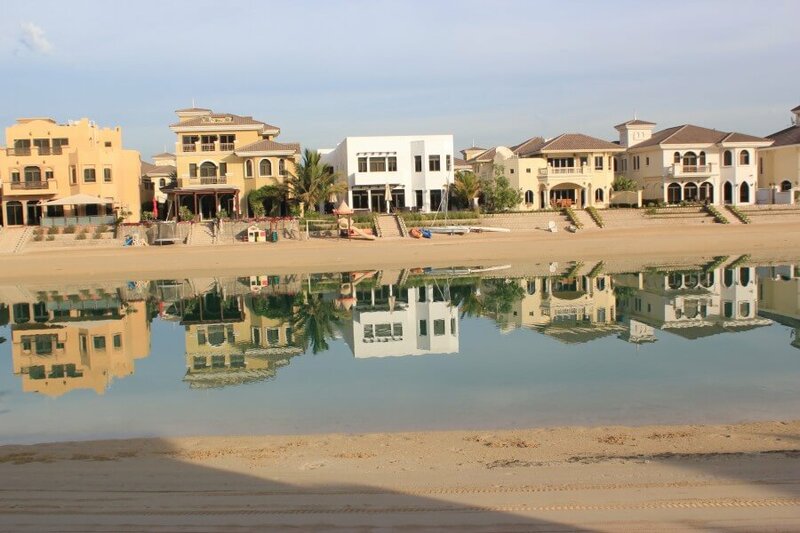 So the Crown Prince of Dubai came up with the palm tree shape to increase the available beachfront. Genius. Along the stem of the palm tree, are hotels and condo buildings, and on each of the 16 palm fronds are single-family homes. In 2001, dredgers began depositing sand and rock, sprayed out from the ship in what looked like a rainbow, guided by satellite GPS. The technique uses vibro-compaction, compacting soil and loose sand with vibrations and water saturation. To protect the island from the waves and tides, a crescent-shaped barrier was built of large rocks and earth. The builders say that divers worked underwater to guide the placement of each rock. The stem of The Palm leads to the crescent via an undersea tunnel. When you come up, you are at The Atlantis, another wonder in itself. Earlier this year—just after we left—severe storms hit the Gulf Region, flooding many parts of Dubai and killing several people. The Palm, however, weathered the storm with only some rising water. If you compare this beach with those in other photos, you can see the difference. The engineers must have known what they were doing. How long can this level of development be sustained? Was The Address fire a warning or a one-off? Who knows. I’m just glad I’ve taken the opportunity to witness this wonder of the world over the past ten years. It’s truly amazing right now. For more photos from Dubai, click on the facebook link below. I’ve never been to Dubai but I’m moving to Oman soon so I’m looking forward to checking it out while I’m there. 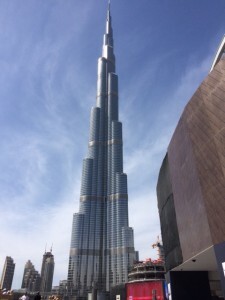 There’s so much crazy engineering in Dubai it must be an amazing place to see! Interesting story about a fascinating place. I hope to visit there (again) sometime!